On Wednesday at the Indianapolis Motor Speedway, a half-dozen Verizon IndyCar Series drivers took part in a test on the 2.5-mile oval. Some were specifically testing Firestone tires while others were testing for their own teams. Andretti and Team Penske’s Helio Castroneves were on hand for Firestone, testing various tire compounds for potential use in 2016. For Castroneves, of course, next year’s “500” is one more chance to join A.J. Foyt, Rick Mears and Al Unser in the four-time winners club. Castroneves’ teammate Simon Pagenaud joined CFH Racing’s Ed Carpenter, Andretti Autosport’s Ryan Hunter Reay and Chip Ganassi Racing’s Tony Kanaan as team testers on Wednesday, driving more for data collection than specifically for Firestone. Any day at IMS, whether it’s in the pressure cooker of May or a pleasant midweek day in August, is precious for gathering that information. And with that, perhaps inching closer to unlocking next May’s mysteries and possibly becoming one of the most famous winners of The Greatest Spectacle in Racing. Simon Pagenaud has watched his teammates since he joined Team Penske at the beginning of the season, but the frenchman stole the spotlight in the fifth practice session heading up into the 99th Running of the Indianapolis 500 mile race. Driving the No. 22 Avaya Team Penske Chevrolet, Pagenaud logged the best of nearly 2,000 laps turned on the Indianapolis Motor Speedway 2.5-mile oval, at 228.793 mph. 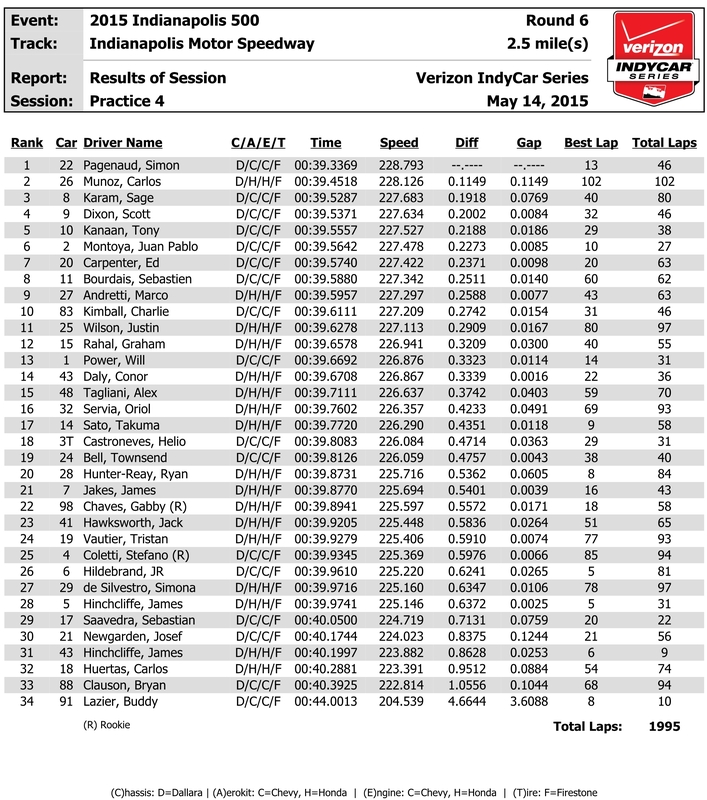 Carlos Munoz, who eclipsed 230 mph in practice Wednesday, was second fastest today in the No. 26 AndrettiTV Cinsay Honda, at 228.126. Pagenaud is teamed with a pair of Indianapolis 500 winners – Helio Castroneves and Juan Pablo Montoya – and reigning Verizon IndyCar Series champion Will Power in the Penske armada. Montoya and Power have each won a race this season, while Castroneves has won two Verizon P1 Awards for taking the pole position. Following Pagenaud and Munoz on the speed chart were Chip Ganassi Racing teammates Sage Karam (227.683), Scott Dixon (227.634) and Tony Kanaan (227.527). Friday marks the final day of practice prior to two days of qualifications that will set the lineup for the 500-mile race on May 24. The lone incident of the day came in the last of the six-hour practice session. Josef Newgarden was uninjured when his No. 21 Century 21 CFH Racing Chevrolet spun and hit the SAFER Barrier exiting Turn 1 in nearly the same spot where Castroneves’ car hit a day earlier. Newgarden’s car slid on its top before coming to rest in the short chute between Turns 1 and 2. Meanwhile, Pippa Mann spent the day recuperating and watching her No. 63 Dale Coyne Racing Honda being repaired after a crash Wednesday that saw her car hit three different walls. She hopes to be back on track Friday afternoon to log important laps prior to qualifying this weekend. Tristan Vautier will drive the No. 19 Dale Coyne Racing Honda in Indianapolis 500 qualifications this weekend in place of James Davison, who will be competing in a sports car race in Canada. Davison, who finished 16th in his first “500” start a year ago, is expected back in the car for the final two practice sessions, on Monday and May 22, before the race on May 24. Vautier completed his refresher program on the 2.5-mile oval today and logged 93 laps with a top speed of 225.406. Davison recorded the fourth-fastest lap (228.043 mph) in practice Wednesday before departing for Canada. “It all came together last minute, but we have been talking about it for quite a while: that if James’ deal would come through I would qualify the car,” Vautier said. “So, yeah, it was not really a surprise for me but more of a long wait to see that everything was confirmed. But it’s really cool. I was happy to get back in an Indy car – it’s been a year and a half now. The first two or three laps were kind of weird, but it came back pretty quickly, so really cool. It was cool to have Simon (Pagenaud, his former teammate) on the track with me for quite a while. It reminded me of the Schmidt (Peterson Motorsports) days, so it was fun. In observance of the 70th anniversary of the end of World War II, 11 WWII veterans will be honored before the national anthem at the Indianapolis 500. Among those honored will be U.S. Army Air Corps Capt. Jerry Yellin, 91, of Fairfield, Iowa, who flew the final combat mission of the war on Aug. 14, 1945, the day the war ended. The veterans recently took a trip to Washington, D.C., on an Indy Honor Flight, a program that offers free-round trip travel to veterans so they may visit the memorials in our nation’s capital that stand in their honor. The No. 91 Wynn Iowa Vision Research Chevrolet driven by 1996 Indianapolis 500 winner Buddy Lazier became the 34th entry to take to the track this week. Larry Curry is team manager for the Lazier Racing Partners entry, with David Cripps the engineer. … All entries will receive an additional 10 kPa of engine turbocharger boost beginning in practice Friday, which should equate to approximately 40 additional horsepower. The engine boost bump will continue through qualifying weekend, with the original limit of 130 kPa reinstated for next week’s final two practice sessions and the race. … INDYCAR announced that the chassis centerline wickers, added to all cars prior to the Angie’s List Grand Prix of Indianapolis on May 9, are optional for the Indianapolis 500. TORRANCE, Calif. (March 9, 2015) – Honda today debuted the package of aerodynamic upgrades and components its teams will use in the 2015 Verizon IndyCar Series, as the manufacturer seeks to add to an already impressive list of accomplishments in American open-wheel racing. The 2015 Honda Indy car “aero kit”, produced by Honda Performance Development, Honda’s racing arm in North America, includes nearly 200 individual pieces that can be fitted to the existing Honda-powered Dallara Indy car chassis. All are intended to give Honda’s six IndyCar Series teams the ability to maximize performance at each of the 15 circuits that make up the 2015 championship schedule. Honda’s Indy car aero kits will make their public debut next week at the Verizon IndyCar Series “Open Test”, March 16-17 at Barber Motorsports Park near Birmingham, Alabama. The 2015 season opens March 29 with the Firestone Grand Prix of St. Petersburg, Florida. HPD was founded in 1993 to spearhead Honda’s entry into Indy car racing. No other manufacturer has matched Honda’s success in Indy cars, which includes 211 race victories, 15 drivers’ championships, six competitive manufacturers’ championships and 10 Indianapolis 500 victories since 2004, including the 2014 event won by Ryan Hunter-Reay of Andretti Autosport. HPD and Honda have a history of success in the classic endurance sports car races, including a pair of LMP2 wins and a privateer LMP1 victory at the 24 Hours of Le Mans since 2010; as well as multiple American Le Mans Series championships and five LMP2 class victories at the 12 Hours of Sebring since 2007. HPD’s Honda engines have recorded 74 race wins at endurance sports car races around the world, with 70 of those victories coming in the HPD-developed line of sports prototype cars. INDIANAPOLIS (March 11, 2015) – Simona de Silvestro was announced today as the fourth driver to the Andretti Autosport Verizon IndyCar Series lineup for the 2015 season. The Thun, Switzerland native is currently confirmed for the season opener with the four-time IndyCar Championship winning team later this month. The 26-year-old competed in Formula Renault 2.0 Italia, Formula BMW USA and the Atlantic Championship prior to moving to IndyCar full time in 2010. de Silvestro has 65 IndyCar starts under her belt that include one podium finish (Houston: Race One, 2013), five laps led and 14 top-10 finishes along with being named the 2010 Indianapolis 500 Rookie of the Year and Tony Renna Rising Star award recipient. The Swiss racer is one of only 3 women who have recorded a podium finish in IndyCar competition. Sarah Fisher and Danica Patrick being the others. The former Formula One test driver joins teammates 2014 Indianapolis 500 Champion Ryan Hunter-Reay, 2014 Sunoco Rookie of the Year Carlos Muñoz and veteran racer Marco Andretti, who will begin his 10th season of Verizon IndyCar Series racing. The newest member of the quartet will head to pre-season testing with the Indianapolis-based outfit, soon marking her first laps behind the wheel of an Andretti Autosport Honda. The 2015 season kicks off with the Firestone Grand Prix of St. Petersburg on the sunny streets of St. Petersburg, FL March 29, live on ABC at 3:00 p.m. ET.